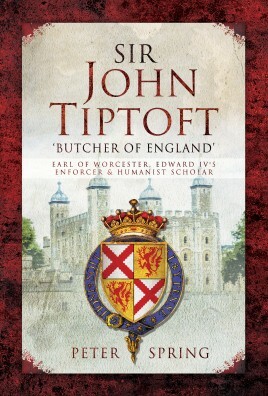 John Tiptoft, Earl of Worcester, is arguably the most intriguing, controversial and possibly misunderstood figure of the Wars of the Roses period. Politically adept, he occupied a string of important offices, first under the Lancastrian Henry VI and then the Yorkist Edward IV. A man of action, he held commands on both and sea, in England, Ireland and Wales. As Constable of England he acted as Edward’s enforcer and earned the sobriquet ‘Butcher of England’ for his beheadings and impalements. Yet he was also an outstanding Renaissance scholar who studied at Oxford, Padua and Ferrara, a collector of books and patron. This, in conjunction with his political actions, makes him a proto-Machiavellian Prince. Peter Spring also looks beyond the Earl’s public life to glean insights into the man himself, concluding that the available information generally reveals an attractive personality. He presents a balanced reappraisal, seeing him, as did many contemporary Europeans and some fellow countrymen, as a man of great intellect and capability who did not shirk the hard tasks imposed by a merciless age. Worcester’s execution for the application of Roman law, lampooned as the ‘laws of Padua’, demonstrated the danger of indentification with continental influences in an England increasingly defining itself—through common law, Parliament, and soon religion—against Europe. The contemporary denigration of his character by little Englander chroniclers reflected a deepening antipathy towards the cosmopolitan — a recurring trait in the English character — perhaps re-emerging with Brexit.